In fact, the list can be extended. 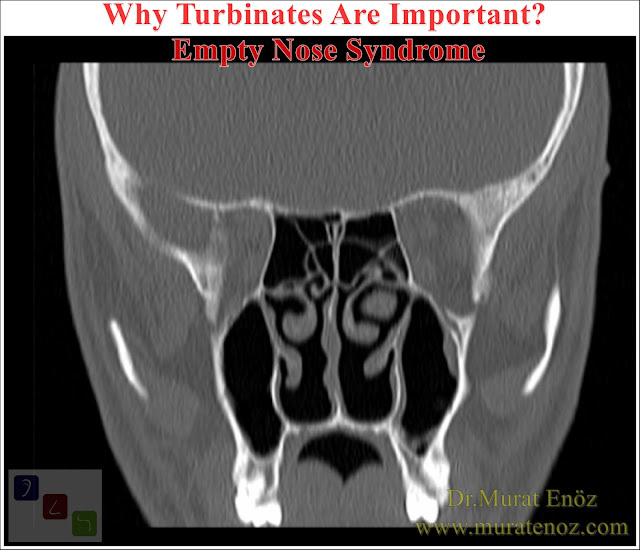 "Turbinate Hypertrophy" can cause a wide variety of symptoms, such as nasal congestion, dry mouth, reduced sleep quality, reduced daily performance. Depending on the nasal obstruction, the lungs are not suited to air expulsion, a reduction in the percentage of oxygen uptake occurs. Treatment of turbinate hypertrophy includes medical treatment and surgical treatment procedures. Medical treatment options are choiced in patients with allergy related symptoms or temporary turbinate hypertrophy. For surgical treatment options are including total or partial inferior turbinectomy (PIT), lateral outfracture of inferior turbinates, submucosal resection with microdebrider, laser-assisted turbinate reduction, plasma surgery, cryosurgery, infrared light, vidian neurectomy, chemical or electrical coagulation and radiofrequency volume turbinate reduction (RFVTR) (source: Radiofrequency volumetric inferior turbinate reduction: long-term clinical results). Only Volume-Reducing Applications Are Recommended! Turinates are very important structures for normal nose functions. Currently minimal traumatic techniques such as radiofrequency turbinate reduction is the most commonly preffered by ent doctors. Radiofrequency inferior turbinate reduction is considered as a safe minimal invasive surgical procedure with only minimal mucosal damage on turbinate, minor patient's discomfort and low side effects for suitabke application (source: Outcomes of surgery for inferior turbinate hypertrophy). 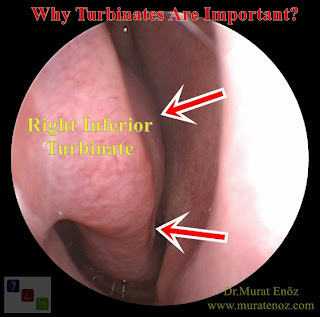 As seen in the upper tomographic image above, when the inferior turbinates are removed surgically near the anterior, there is an abnormal increase in intranasal volume. For this reason, when we breathe into the nose, the incoming air moves very quickly, moving towards as the dirty, cold, unhumidified and unpressurized to lungs. Over time, nasal mucosa, nasal airway, nasal and lower respiratory tract dryness, infection and tissue changes are inevitable. Recently, "empty nose syndrome" and highlighted videotapes related to intranasal hyperventilation (hyperventilation syndrome) have been published in websites. In patients with turbinate hypertrophy, these tissues are considered to be an "organ", the "organ-protective interventions" are suitable to reduce the volume of the existing volume. Complete surgical removal of the turbinates or excessive reduction of their volume can cause serious health problems that may affect the patient for life.